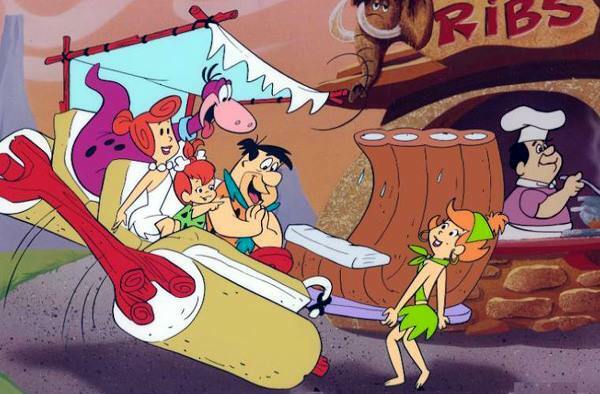 I don’t live in Bedrock but I figured “How hard could it be to find a good cut of beef short rib?” Seems grocery stores had no clue what I was talking about, Costco said nobody buys them so they never have them and a couple butchers said the same thing as Costco and offered me beef back ribs instead….fortunately, I stumbled upon a new local spot that had a problem, they had short ribs and couldn’t find anyone to buy them….it was like fate brought us together! 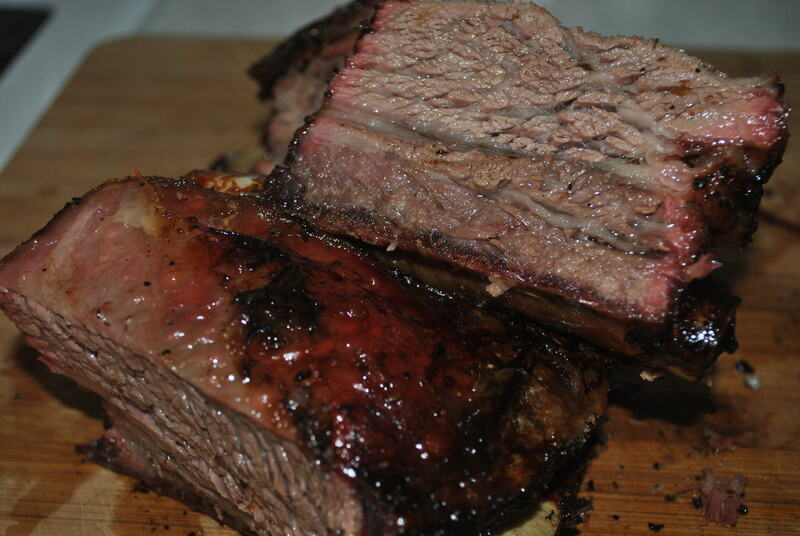 🙂 Beef short ribs are not called “short” because of their length, it is because they are cut from the the short plate of the primal. 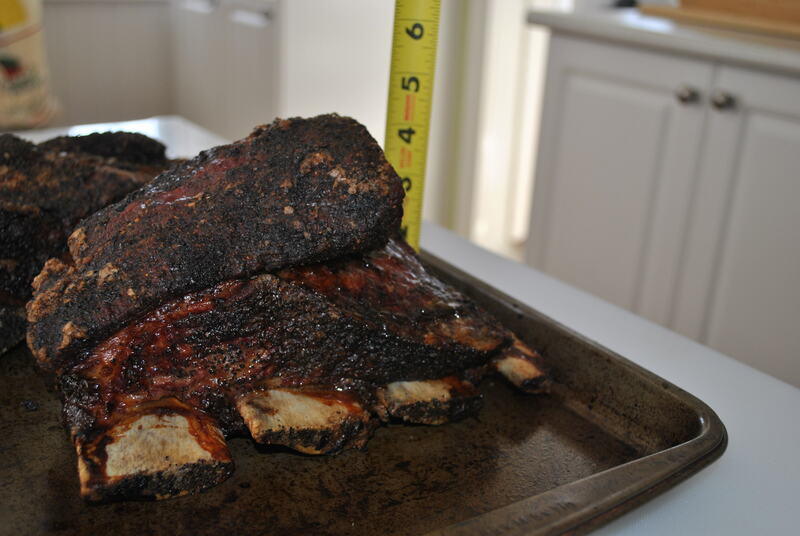 One key difference between short ribs and back ribs is that the meat is on top of the bone of a short rib….on a back rib, there is meat on both sides of the bone. 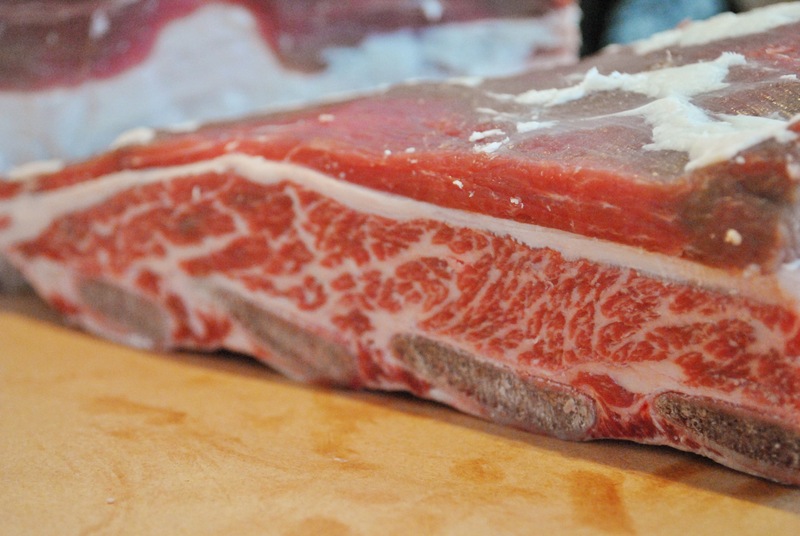 Here is a pic of a nicely trimmed short rib. You can see the bones on the bottom and all the meat is laying on top. The marbling in this slab is quite nice which will really give some great flavour during the cooking process. 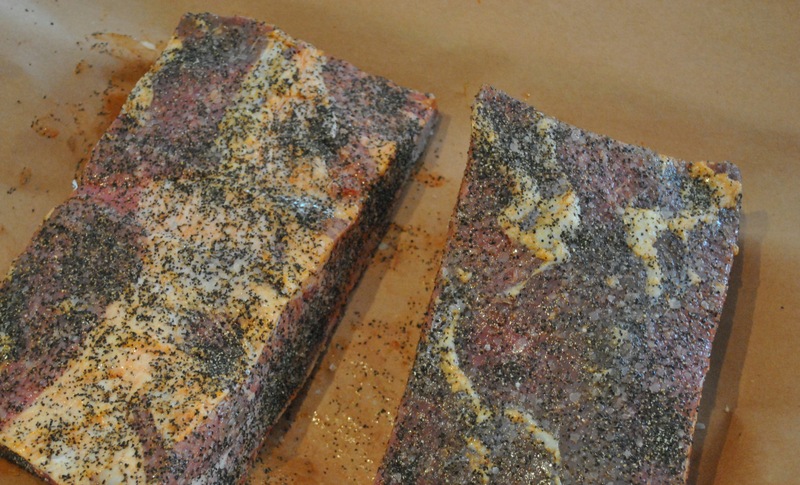 Next up is a simple salt & pepper rub. One thing I loved about the butcher that sourced these is that he is a firm believer in the ethical treatment and raising of the livestock. Everything he sells has been grass-fed, locally pasture raised and no hormones or other crazy stuff has ever been injected or given to them. What is one way to quickly determine if the livestock has been ethically raised or not? Just take a look at the colour of the fat on the cut of meat. If it’s yellowish, then it has been living off grass and organic food. If it’s a nice pearly white, then it has been fed a diet high in corn, cereals and god knows what else that isn’t a natural diet for them. As you can see here, there is a nice concentration of yellow fat in these ribs. Exactly what I was looking for.